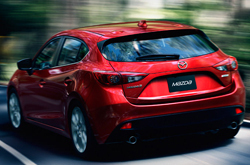 Back again for 2015, the Mazda3 continues to be one of the best models in its class. It's available with excellent fuel-efficient engines, offers fast acceleration, and sports outstanding handling, which keeps drawing buyers in time after time. Aside from these benefits, the 2015 Mazda3 is being offered with a new six-speed manual transmission this year, and features minimal changes to its standard and optional equipment. Read our 2015 Mazda3 review below to acquire more details about the latest model and its wide range of first-class amenities. 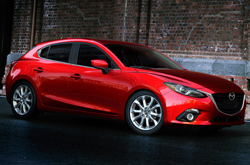 The 2015 Mazda3 in Houston is available two engines this model year: a 2.0L four-cylinder & 2.5L four-cylinder. The former, which delivers 155 horsepower and 150 lb.-ft. of torque, is fitted on all Mazda3 I models and can be paired with either a six-speed manual or six-speed automatic transmission. With the latter transmission, sedan i models produce an EPA-estimated 34 mpg combined. The manual-equipped sedans see a slight dip in EPA ratings, but still produce an astounding EPA-estimated 33 mpg combined. The remainder of the Mazda3 models come equipped with a 2.5L four-cylinder engine, producing 184 horsepower and 185 lb.-ft. of torque. It can be matched with either a six-speed automatic or manual transmission and delivers an EPA-estimated 32 mpg combined with the automatic. Outside of these fantastic performance traits, the 2015 Mazda3 in Houston is available with a range of amazing features. Select models come outfitted with HD Radio, blind-spot warning, Bluetooth hands-free calling, leather upholstery, navigation, keyless entry/ignition and a nine-speaker Bose audio system. A rearview camera is also available on the Mazda3 I Touring model, providing extra assistance when parking, while the Mazda3 S Grand Touring offers forward collision warning. To find out more details about the latest Mazda3, keeping reading our 2015 Mazda3 review for additional information. 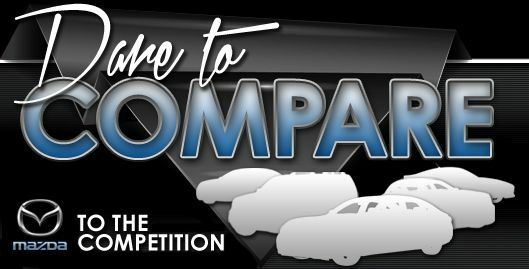 When you compare Mazda's newest Mazda3 model alongside the 2015 Hyundai Elantra, Chevy Cruze and the Honda Civic, you'll discover that it beats out the competition. The Mazda3's splendid looks, user-friendly cabin amenities and budget-friendly MSRP are sure to win over TX shoppers. For Houston Mazda customers who want a truly amazing value, just compare this vehicle's price to the aforestated list of vehicles and you'll see that it's a solid investment. Check out our Quick List below this paragraph for more info! 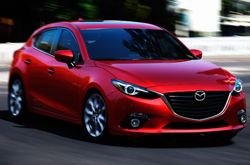 The 2015 Mazda3 review above was penned by Joe Myers Mazda's automotive writers; for information about preceding models please view the links in the sidebar. As the respected Mazda dealership in Houston it is our job to provide our customers with reviews recorded by the finest Mazda writers around. To make sensible decisions when it comes to your next Mazda purchase, don't guess! Each passage is jammed with information, including info about vehicle features, in an easy-to-understand layout. Discover more about our attractive portfolio of vehicles; visit the research archive to review and compare other models on sale at Joe Myers Mazda now!